Bringing Stapeley into bloom – Our Space, Your Place. A local Parish Action Group, in Stapeley, is celebrating after receiving a donation from David Wilson Homes North West’s Our Space, Your Place scheme. 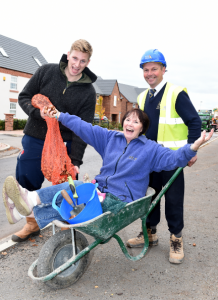 The housebuilder’s scheme, which offers support to community groups in the region through volunteer time or funding, provided more than 3,000 daffodil, crocus and bluebell bulbs to help bring the local area into bloom. The team from Our Space Your Place also went down on the day to lend a hand and help plant the bulbs ready for spring. Stapeley Parish Action Group implements projects and supports Parish Council initiatives involving the local community. It enabled the installation of the popular Children’s Playground on land adjacent to Pear Tree School, Stapeley and also runs Litter Pick Groups, participates in Speedwatch monitoring and acts as a liaison and focus group between the community and local Councils.